Volksdeutscher Selbstschutz (German: ethnic self-defense or self-protection), also known as the Selbstschutz battalions, were a paramilitary organisation consisting of ethnic German Volksdeutsche mobilized from among the German minority in Poland. Volksdeutscher Selbstschutz operated before and during the opening stages of World War II in the western half of the Second Polish Republic. Throughout the interwar period the Selbstschutz battalions were deployed by the German intelligence not only in newly reborn Poland but also in Czechoslovakia. Armed with weapons and ammunition smuggled from Germany, they fought on the German side of the Polish/German conflict already in 1921. 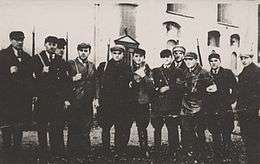 Both Selbstschutz and Freikorps mercenaries were sent to fight Polish partisans in the Third Silesian Uprising for political control of Upper Silesia. The Selbstschutz fifth column worked to indoctrinate ethnic Germans locally, while preparations were under way elsewhere, especially in the late 1930s. The Selbstschutz commandos committed acts of terrorism in the summer of 1938 against the Czech administration of the Sudetenland. In the interwar period, the German minority organizations in Poland included Jungdeutsche Partei (Young German party), Deutsche Vereinigung (United German), Deutscher Volksbund (German peoples Union) and Deutscher Volksverband (German peoples United). All of them actively cooperated with Nazi Germany in anti-Polish espionage, sabotage, provocations, and political indoctrination. They maintained close contact with and were directed by the NSDAP (Nazi Party), Auslandsorganisation (Foreign Affairs Organization), Gestapo (Secret Police), SD (Security Service) and Abwehr (Defense). It is estimated that 25% of the German minority in Poland were members of these organisations. Nazi Mayor of Bydgoszcz Werner Kampe, with Josef Meier and Ludolf von Alvensleben - leader of Selbstschutz in Pomerania during inspection of Volksdeutscher Selbstschutz in 1939. 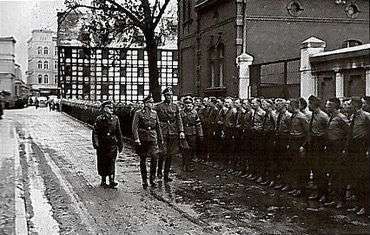 By October 1938, the SD agents from Germany have organized the Selbstschutz formations in Poland. The ethnic Germans with Polish citizenship have been trained in the Third Reich in various sabotage methods and guerilla tactics. Before the war began, Selbstschutz activists from Poland compiled lists of Poles who were to be removed or executed in Operation Tannenberg. The list was distributed among Nazi death squads as the Special Prosecution Book-Poland (germ.Sonderfahndungsbuch Polen). Immediately after the invasion of Poland on 1 September 1939, Volksdeutscher Selbstschutz engaged in attacks against the Polish population and the army, and performed sabotage operations helping the German advance across the Polish state. In mid-September, the chaotic and largely spontaneous activities of this organization were coordinated by SS officers. Himmler's protégé Gustav Berger was placed in charge of the organization. District commanders from the army in occupied zones were put in charge at West Prussia, Upper Silesia and Warthegau. 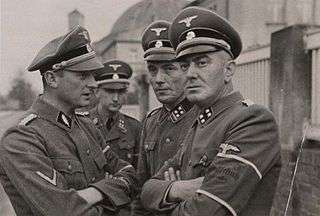 While the SS leadership was limited to overseeing the operations, local units remained under the control of ethnic Germans who had proven their commitment at the beginning of the war. Selbstschutz organized concentration camps for the Poles. They were founded in places where the Wehrmacht and German police units established camps. There were 19 such camps in the following places: Bydgoszcz (Bromberg), Brodnica (Strasburg), Chełmno (Kulm), Dorposz Szlachecki, Kamień Krajeński, Karolewo, Lipno (Lippe), Łobżenica, Nakło (Nakel), Nowy Wiec (near Skarszewy), Nowe (over Vistula), Piastoszyn, Płutowo, Sępólno Krajeńskie, Solec Kujawski (Schulitz), Tuchola (Tuchel), Wąbrzeźno (Briesen), Wolental (near Skórcz), Wyrzysk (Wirsitz). The majority of the Poles imprisoned in those camps (consisting of men, women and youth) were brutally murdered. 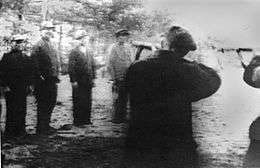 After German invasion of Poland, Selbstschutz worked together with the Einsatzgruppen to massacre Poles. Selbstschutz took part in the first action of elimination of Polish intelligentsia, the mass murders in Piaśnica, during which 12,000 to 16,000 civilians were murdered. An Intelligenzaktion was a plan to eliminate all Polish intelligentsia and Poland's leadership class in the country. These operations took place soon after the fall of Poland, lasting from the fall of 1939 until the spring of 1940. 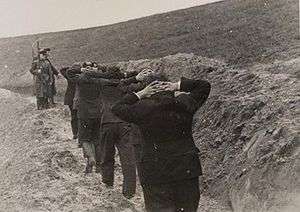 As the result in 10 regional actions 60,000 landowners, teachers, Polish entrepreneurs, social workers, military veterans, members of national organisations, priests, judges and political activists were killed. The Intelligenzaktions were continued by the German AB-Aktion operation in Poland. By 5 October 1939, in West Prussia alone, Selbstschutz under the command of Ludolf von Alvensleben was 17,667 men strong, and had already executed 4,247 Poles, while Alvensleben complained to Selbstschutz officers that too few Poles had been shot. (German officers had reported that only a fraction of Poles had been "destroyed" in the region with the total number of those executed in West Prussia during this action being about 20,000. One Selbstschutz commander, Wilhelm Richardt, said in Karolewo (Karlhof) camp that he did not want to build big camps for Poles and feed them, and that it was an honour for Poles to fertilize the German soil with their corpses There was little opposition or lack of enthusiasm for activities of the Selbstschutz among those involved in the action. There was even a case where a Selbstschutz commander was relieved after he failed to account for all the Poles that were required, and it was found that he executed "only" 300 Poles. The organization was ordered to be dissolved on 26 November 1939, but the changeover continued until the spring of 1940. Among the reasons were instances of extreme corruption, disorderly behaviour and conflicts with other organizations. Members were instructed to join Schutzstaffel and Gestapo instead. In the summer of 1940, the new Sonderdienst battalions were formed in place of Selbstschutz and assigned to the head of the civil administration in the new Gau. The existence of a large paramilitary organization of ethnic Germans with Polish citizenship that engaged in widespread massacres of Poles and helped in the German attack on Poland later served as one of the reasons for the expulsion of Germans after the war. According to German researcher Dieter Schenk, some 1,701 former members of Selbstschutz who committed mass atrocities were identified in postwar Germany. However, there were only 258 cases of judicial investigations, and 233 of them were cancelled. Only ten Selbstschutz members were ever sentenced by the German courts. This situation was described by Schenk as a "disgrace for the German court system". 1 2 3 4 Redakcja (2009). "Piąta kolumna". Kampania Wrześniowa 1939.pl. Mapa serwisu – via Internet Archive. Na wielką skalę działała hitlerowska piąta kolumna w Polsce opierająca się na organizacjach hitlerowskich: Jungdeutsche Partei (na terenie całej Polski), Deutsche Vereinigung (Pomorze Poznańskie), Deutscher Volksbund (Śląsk), Deutscher Volksverbarid (Łódzkie), oraz ich filialnych stowarzyszeniach i związkach (wszystkie zrzeszały 25% mniejszości niem.). Organizacje te bezpośrednio lub pośrednio utrzymywały tajne kontakty z partyjnymi i państwowymi centralami berlińskimi: NSDAP, Auslandsorganisation, Gestapo, SD, Abwehrą i in., prowadząc wg ich instrukcji wrogą działalność dywersyjną (szpiegowską, sabotażową, prowokacyjną, polityczno-destrukcyjną). ↑ Sidney S. Alderman (Associate Trial Counsel for the United States). "Nuremberg Trial Proceedings Vol. 3 - Eleventh Day". The Avalon Project. In both Austria and Czechoslovakia the Nazi conspirators planned to undermine the will to resist by propaganda and by Fifth Column activities, while the actual military preparations were being developed. ↑ Digital version of "Sonderfahndungsbuch Polen" in Śląska Biblioteka Cyfrowa "Sonderfahndungsbuch Polen", hrsg. vom Reichskriminalpolizeiamt, Berlin 1939. ↑ Browning, Christopher R. (1998) . "Arrival in Poland" (PDF file, direct download 7.91 MB complete). Ordinary Men: Reserve Police Battalion 101 and the Final Solution in Poland. Penguin Books. pp. 51, 98, 109, 124. Retrieved May 1, 2013. Also: PDF cache archived by WebCite. ↑ Biuletyn IPN 2003-2004 Nr 12-1(35-36) page 23 Paweł Kosiński, Barbara Polak: "Nie zamierzam podejmować żadnej polemiki – wywiad z prof. Witoldem Kuleszą". Barbara Bojarska: Eksterminacja inteligencji polskiej na Pomorzu Gdańskim (wrzesień-grudzień 1939). Poznań: Instytut Zachodni, 1972. Christopher R. Browning: The Origins of the Final Solution: The Evolution of Nazi Jewish Policy, September 1939 – March 1942. University of Nebraska Press. ISBN 0-8032-1327-1. Keith Bullivant, Geoffrey Giles: Germany and Eastern Europe: Cultural Identities and Cultural Differences. Rodopi Bv Editions, 1999. ISBN 978-9042006881. Christian Jansen, Arno Weckbecker: Der “Volksdeutsche Selbstschutz” in Polen 1939/40. München: R. Oldenbourg, 1992. ISBN 3-486-64564-1. Włodzimierz Jastrzębski, Jan Sziling: Okupacja hitlerowska na Pomorzu Gdańskim w latach 1939–1945. Gdańsk: Wydawnictwo Morskie, 1979. ISBN 83-215-71840. Tadeusz Jaszowski, Czesław Sobecki: „Niemy świadek”. Zbrodnie hitlerowskie w toruńskim Forcie VII i w lesie Barbarka. Bydgoszcz: Kujawsko-Pomorskie Towarzystwo Kulturalne, 1971. Georges Jerome : Les milices d'autoprotection de la communauté allemande de Pomérélie, Posnanie et Silésie polonaise 1939 - 1940. Revue Guerres Mondiales et Conflits contemporains n° 163 juillet 1991. Paweł Kosiński, Barbara Polak. Nie zamierzam podejmować żadnej polemiki – wywiad z prof. Witoldem Kuleszą. „Biuletyn IPN”. 12-1 (35-36), grudzień – styczeń 2003–2004. Roman Kozłowski (1992): Mniszek – miejsce kaźni. Dragacz: Gminny Komitet Ochrony Pomników Walki i Męczeństwa. Mirosław Krajewski: W cieniu wojny i okupacji. Ziemia Dobrzyńska w latach 1939–1945. Rypin: Dobrzyński Oddział Włocławskiego Towarzystwa Naukowego w Rypinie, 1995. OCLC 750495343. Stanisław Nawrocki: Policja hitlerowska w tzw. Kraju Warty 1939–1945. Poznań: Instytut Zachodni, 1970. Dieter Schenk: Albert Forster. Gdański namiestnik Hitlera. Gdańsk: Wydawnictwo Oskar, 2002. ISBN 83-86181-83-4. Piotr Semków. Martyrologia Polaków z Pomorza Gdańskiego w latach II wojny światowej. „Biuletyn IPN”. 8 – 9 (67 – 68), sierpień-wrzesień 2006. Irena Sroka: Policja Hitlerowska w rejencji katowickiej w latach 1939–1945. Opole: Instytut Śląski, 1997.